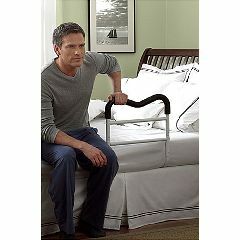 M-Rail contoured bed rail is safer and easier to grip than conventional assistive rails. Unique design allows for two-handed gripping when user rises to the seated position. No-slip, foam-covered grip for added safety. Strong nylon straps wrap around box springs to provide more counter weight and extra-secure installation. Three-piece construction easily dismantles for transportation. Fits single to king size beds. No tools required. Caregiver. So glad I purchased this..
My mother had shoulder surgery and now has limited movement. The device helps her to get out of bed by herself. Works Great, and easy to install. Elderly. So glad I purchased this.. This Guard Rail was a breeze to install on our bed, and it works great. It is big enough to give that secure feeling, but still small enough not to feel like it is in the way, or cumbersome. Great product. My Dad had trouble getting in and out of bed due to pain in his back. Now he is able to sleep in his bed instead of the chair since getting in and out is easier with the railing. Great product. I would buy again! Safe. Sturdy. My mother feels safer. . Elderly. My mother feels so much s.
My mother feels so much safer with this on her bed. She tells me every day how much she loves it. Does the rail fold into a flat package for ease of travel? Weight ? Would the strap fit around a California King size bed? Thanks! Could 250 pound person use this rail to pull himself up toward the head of the bed? Absolutely. My husband is 260 lbs & greatly relies on this rail. We've used other rails, but this one is the best. Also, have same rail that we take with us when we travel. we have a posturpedic mattress sitting on a platform. Will this rail work? Yes it would, just strap it around the platform, it would probably be even more secure. Can this be used with electric beds, i,e. Temerpedic ergo? How far under the mattress does this hand rail go. Is it attached, or does it just slip between mattress and box springs? The strap goes fully around a queen size matress. This product is really sturdy. A 200 pound lady leans on it and pulls it and it doesn't move. About three feet which means that when using it to get out of bed your body weight is also helping to hold it in place. My mother loves this handrail. In addition to the metal "legs" that extend nearly 2 feet under the mattress, the sturdy web straps go completely around the box spring so the handrail doesn't slip at all.